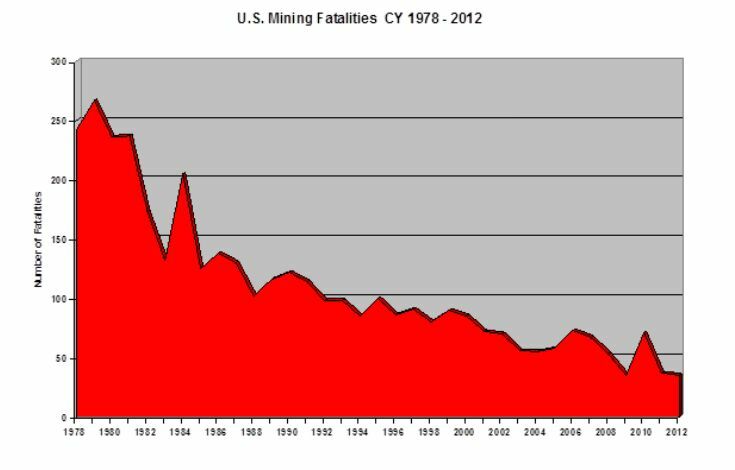 The US released preliminary 2012 data Tuesday indicating the lowest fatality and injury rates in the history of the country's mining sector. The mine safety and health administration, part of the federal labour department, said in a written statement the action of both government and industry contributed to the reduced numbers. 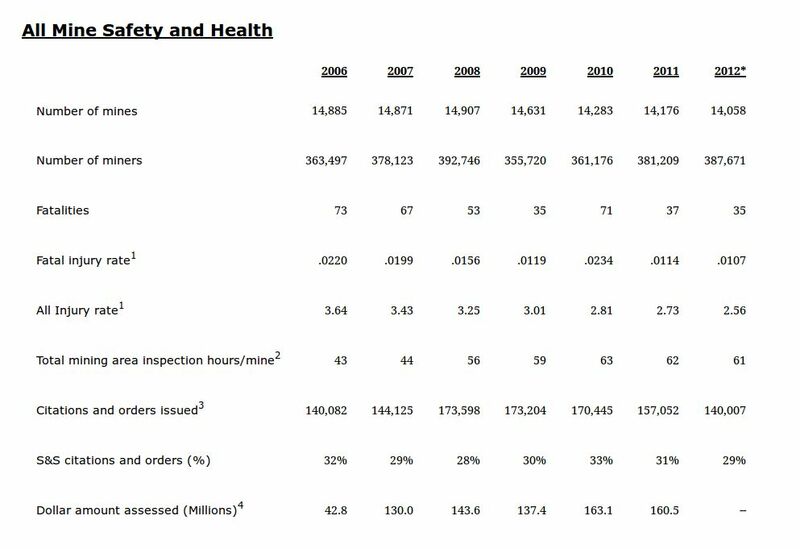 In 2012, the fatality rate was .0107 deaths per 200,000 hours worked while reported injuries were 2.56 per 200,000 hours worked — lower than the prior year’s rates. Although the number of mines in the US decreased slightly, from 14,176 in 2011 to 14,058 in 2012, the number of miners increased from 381,209 to 387,671. Last year, 35 miners died on the job, tying the record low number of deaths in mining set in 2009. The number of citations and orders issued by the government fell from 157,052 in 2011 to 140,007 in 2012, an 11% decrease. Authorized Representatives of the Secretary (AR) for certain inspection activities and task codes. 4-Based on date issued. Data for 2012 are not yet available. In coal mining, 19 miners died in on-the-job accidents last year, the second lowest number ever. The fatality rate was .0151 deaths per 200,000 hours worked, also the second lowest ever recorded. Reported injuries were 3.15 per 200,000 hours worked, the lowest ever recorded. The number of citations and orders issued declined, from 93,451 in 2011 to 79,327 in 2012, a 15% reduction. For coal mines, the number decreased from 1,973 to 1,865 and in production from 1,095 to 1,017 million tons year on year. The number of coal miners also decreased from a decades-long high of 143,437 in 2011 to 137,361 in 2012. In metal and non-metal mining, the record-low fatality rate was .0080 deaths per 200,000 hours worked. In on-the-job accidents, 16 miners died, equalling the record low set in 2011. The reported injury rate of 2.19 per 200,000 hours worked was a record low as well. Citations and orders issued dropped from 63,601 to 60,680 year on year, a 5% reduction. While the number of metal and non-metal mines remained steady in 2012, at 12,193, the number of miners increased from 237,772 in 2011 to 250,310 in 2012.